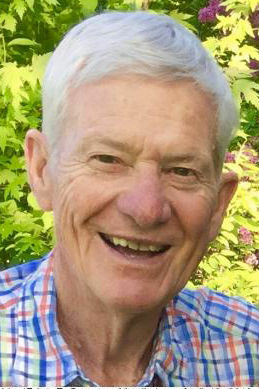 MADISON—Fredric E. “Fritz” Grutzner, 83, died on April 13, 2019. He leaves Janice, his wife of 61 years, and five children, Heidi (Don), Fritz (Kris), Eric (Barb), Lisbeth and Jon (Julie). He was a source of support and great fun to his grandchildren: Molly (Dan), Thomas, Elisa, Michael, Eva (Bradley), Sophie, Anna, Erich, Mackenzie, Tyler, Clara and Maddie. He was born in Beloit, Wis. on Feb. 21, 1936, to Fritz and Gertrude Grutzner. At Beloit High, he lettered in baseball, golf and football. While in junior high, Janice saw a baseball game and somehow knew at that moment that she would marry the guy playing third base. He went to the UW-Madison on a baseball scholarship, played trombone in the marching band, and graduated from the UW School of Commerce in 1958. Fritz and Janice married later that year. Fritz was a creative thinker and a hard worker. He was a salesman for National Cash Register and a real estate developer with Madsen Construction (later, Meridian.) He made important contributions to the community in affordable housing through his work with Future Madison and Madsen. Fritz and Janice were both very involved with the early work of the Drop In Shelter and Transitional Housing, now called Porchlight. Fritz’s family was always at the center of his life. His kids remember he never missed a swim meet, tennis or lacrosse match, soccer game, crew regatta, or band or choir concert. Friends loved his humor and ability to make a game of everything, whether it was competing in racquetball, tennis, or a game of Hearts. Fritz made life fun for the people around him and his many groups of friends. These included, The Group, book club, Advocates, whose ironic motto was “Self Before Service,” Sunday night dinner and a movie, Sheepshead and cribbage (he was pretty sure Tinker still owed him money). He spent many happy, gorgeous days with his friends and family on Madeline Island, where he was always organizing a blanket toss, a game of bocce ball, or telling stories around his famous campfire. Fritz really disliked wearing ties and going to funerals. In lieu of a formal service, the family will host three smaller, informal celebrations of Fritz’s life at the home of Janice and Fritz. Friends and family are free to drop by any one of them on May 10, 2019, any time between 1 p.m. and 4 p.m. or 7 p.m. and 9 p.m., and May 11, 2019, from 1 p.m. to 5 p.m. Please contact fgrutzner@brandgarten.com or lisbethsato@sbcglobal.net if you need the address. Please share any memories and stories about Fritz online at www.cressfuneralservice.com. In lieu of gifts or flowers, donations can be made in Fritz’s honor to Porchlight https://interland3.donorperfect.net/weblink/weblink.aspx?name=E343331&amp;id=1; or the Grutzner Madeline Island Fund https://www.dsacommunityfoundation.org/grutzner-madeline-island-fund?tt=0. Janice would also very much welcome visits from friends and family over the course of the next year. the life of: Grutzner, Fredric E. "Fritz"